To import products, log into your admin panel. Then click Tools > Data Import to get to the import options. To add or update items, prepare your data in .CSV file format using Excel or a similar application. Note: If you have a data file from another system, column names can map to their expected counterparts after the file loads. On this screen you will see a link: click to download the Sample File (used as a reference for uploading). 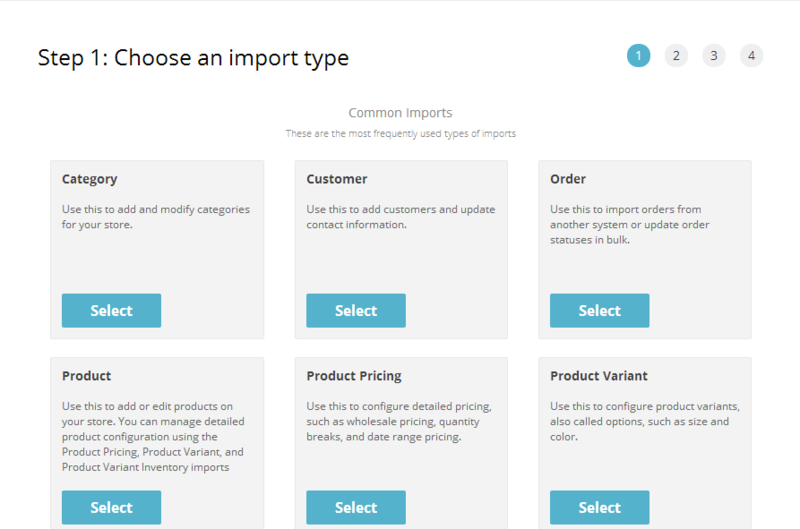 Click the link to download a CSV file that you can use to import your product data. Some columns need special formatting, so it may not be possible to map all fields without modification. After preparing the data, upload and select your .CSV file using the file browser. then select the appropriate options and click Load. Next select Load up top. Step 2 Map your data columns allows you to map the columns from your CSV file to the AmeriCommerce online store . If you used our template, you can skip this step because all the data is properly categorized. If you have your own format, pick one of your columns on the left and select our matching column. If you wish, you can save the current mapping scheme for future use at the top of the page. Next time you come to import the same file, you will not have to re-map the data again. Some fields in the column map are required however. View the list at the end of this article for all required data fields. Next press Import up top and the import process begins. Congratulations! You have imported new products into your catalog. Use similar methods with the Import Wizard for handling customer and order lists, tracking information, and inventory data. Note: In order to remove a the values for field in the database you will need to place <<DELETE>> in the corresponding field on the import.